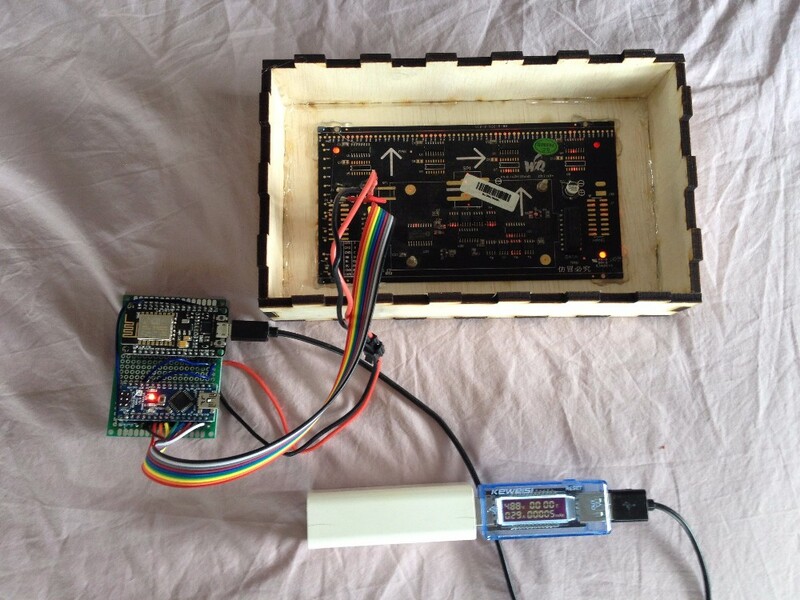 This box shows the time (NTP sync) and a few data feeds of my home monitoring system. 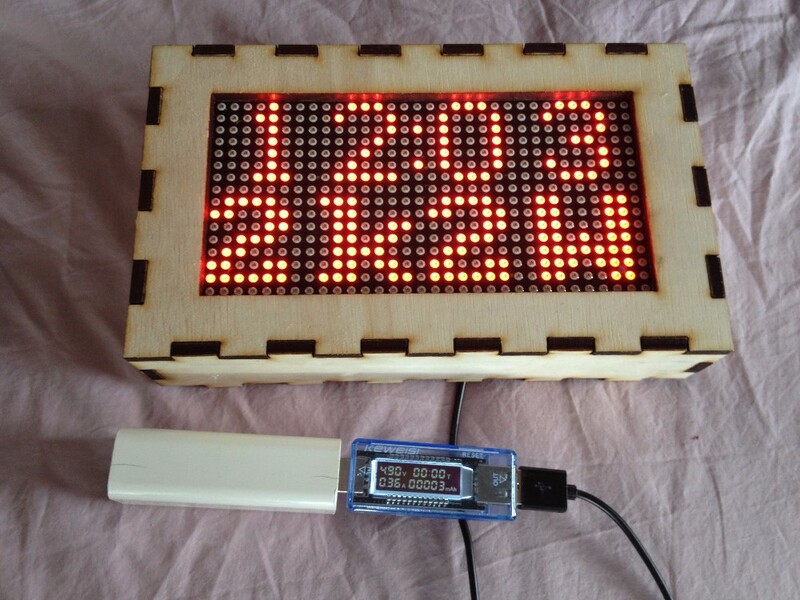 It uses a 32×16 LED matrix driven by an Arduino Nano, and ESP8266 Wifi module (NodeMCU v1). 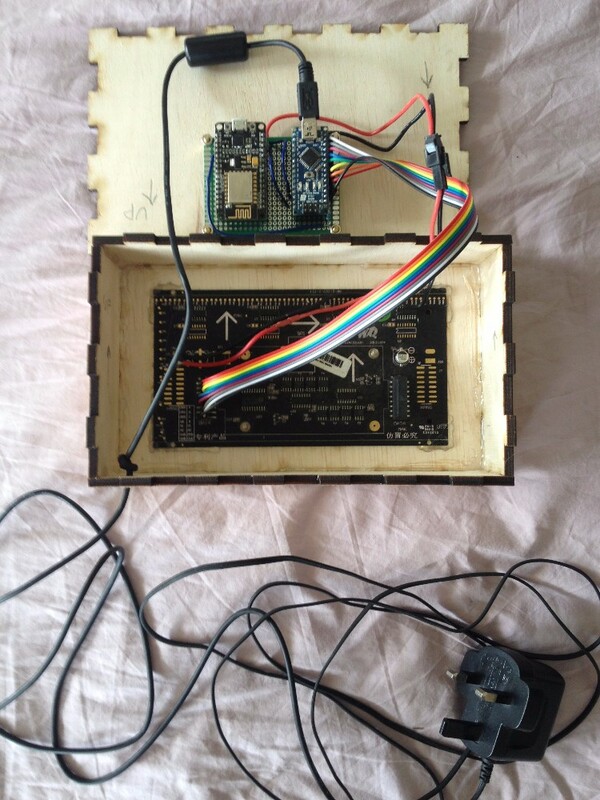 I put it in a laser cut wooden box, and powered it from a USB phone charger. I got this (monochrome) LED matrix a few years ago from Seeedstudio (now only available in RGB); it is based on 74HC595 and 74HC138 chips to do the multiplexing, and came with this basic library. 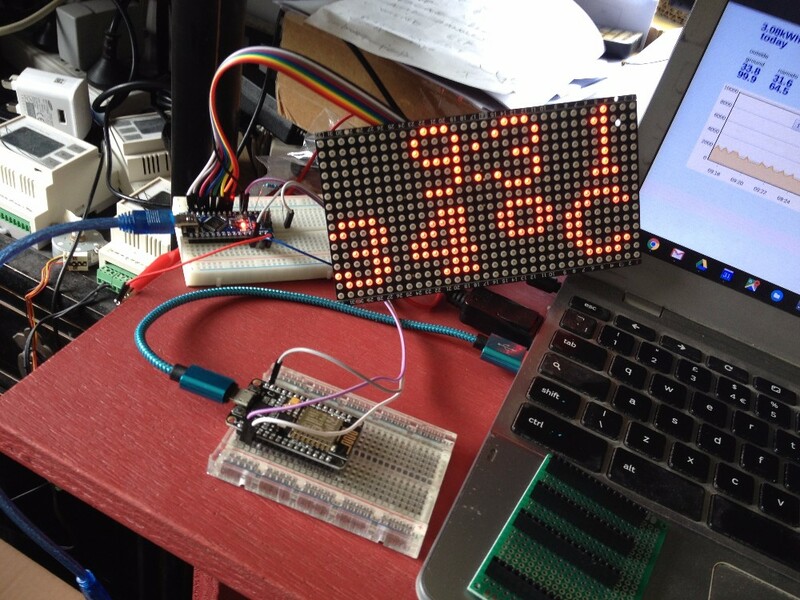 Easy to make it work with an Arduino, but no fonts included in the library, only digits. I found a good 8×8 font bitmap here and added it to my code. As the library only allows writing a character to each tile of 8×8 LEDs, i only got 2 rows of 4 characters. I did try to drive the matrix directly from an ESP8266 (NodeMCUv1, via Arduino IDE) but i could not get that to work (timing problem) so i decided to stick with the Arduino Nano for the matrix driver, and the ESP8266 for fetching the data and pushing them over a Serial connection to the Arduino. The Arduino and NodeMCU share the 5V power supply (5V on the Arduino, Vin on the NodeMCU), and their only connection is the Serial TX pin on the NodeMCU to the Serial RX pin (D0) on the Arduino, with a 220Ω resistor in between so the ESP8266 TX pin does not get the full 5V of the RX on the Arduino. The ESP8266 sends simple Strings at 9600 baud, in the format “T1448*” for time 14:48 and “S1k2W*” for 1k2W as in the above picture. Network Time Servers make the time available online, so a piece of cake for the ESP8266 Wifi module to sync the time, with this NTPclient library (Arduino IDE). 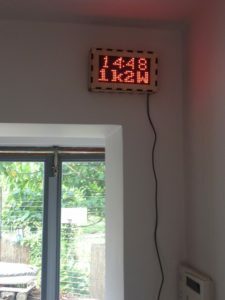 My initial idea was to build just a clock to hang in our living room, to make sure the kids leave on time in the morning to catch their ferry to school. 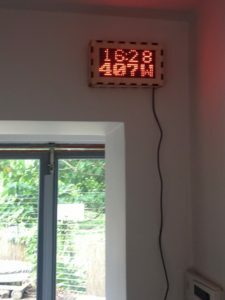 I wanted to sync this clock over the internet, so i realised i could add some more data feeds to the display, and i got plenty to choose from (see above). I have a home monitoring system based on the OpenEnergyMonitor platform, and its excellent emoncms.org cloud server. This system has been running for over 3 years, collecting electricity consumption (6 phases) and temperature, humidity, wind data, with solar powered nodes. Total energy consumption of our house, in Watts. As i only have 4 digits, i have to format the data, e.g. 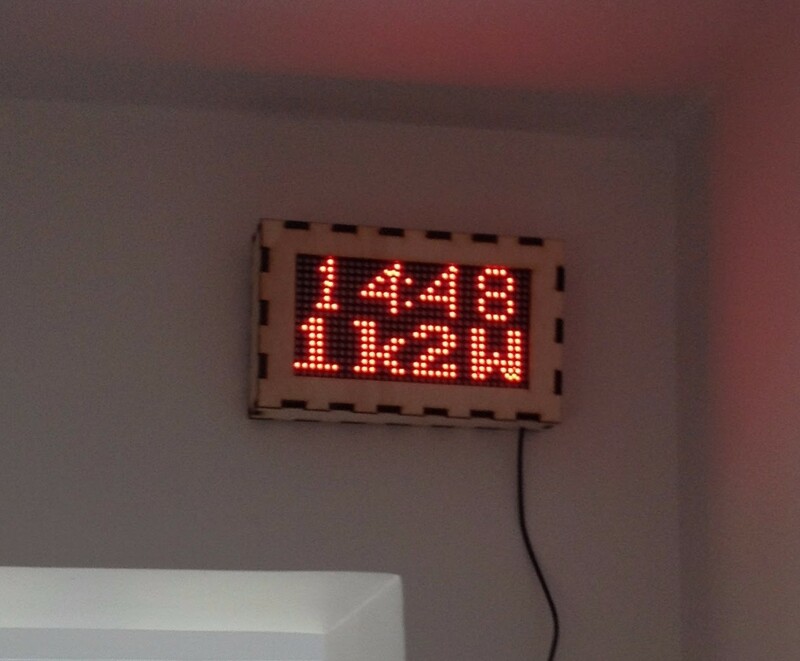 945W, 1k2W, 14kW to fit the display. This is done on the ESP8266 so the Arduino just has to display the String it receives. Outside temperature, in degrees Celsius, with no decimals, to fit 4 digits. The LED matrix came with 2 thick power supply wires, which made me a bit worried about current needed. I tested this with my USB power monitor, and the entire project only draws up to 500mA, no problem at all for my USB phone charger. The matrix is a bit too bright, so i tried using PWM on the OE pin (output enable) by modifying the library, but that did not seem to make a difference. I assume it would work by putting a PWM signal on the matrix power wires, with a MOSFET on an Arduino pin but i did not test that. I soldered 15-pin female headers on a perf board, for the Arduino Nano and the NodeMCU, and a few wires for power and the Serial connection, and the ribbon cable to the display: 8 data pins plus GND. As the box seemed to have trouble sometimes connecting to my home Wifi network (about 10m away, 1 floor up), resulting in a 00:00 time display and no data feed, i added a large capacitor (3300uF) on the power rail and that seems to fix it. NTPclient library: Copyright 2016 German Martin (gmag11@gmail.com). All rights reserved. // if (hour() != 0 && minute() != 0) syncEventTriggered = false; // in case time = 00:00 then need to trigger sync again! 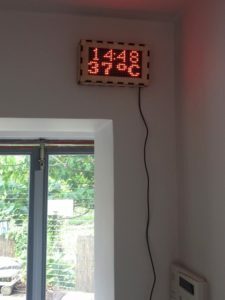 The LED Matrix panel has 32x16 pixels. Several panel can be combined together as a large screen. The example is for ATmega168/328 and depends on Timer1 library (http://playground.arduino.cc/code/timer1). 1) Does it work with monochrome 16×64 screen (HUB08)? 3) Can work only with nodeMCU? My panel is also HUB08 as far as i know (one set of RGB pins and 4 bits for the 16 rows) – it seems the library can accept different widths so maybe 64 will work as well. 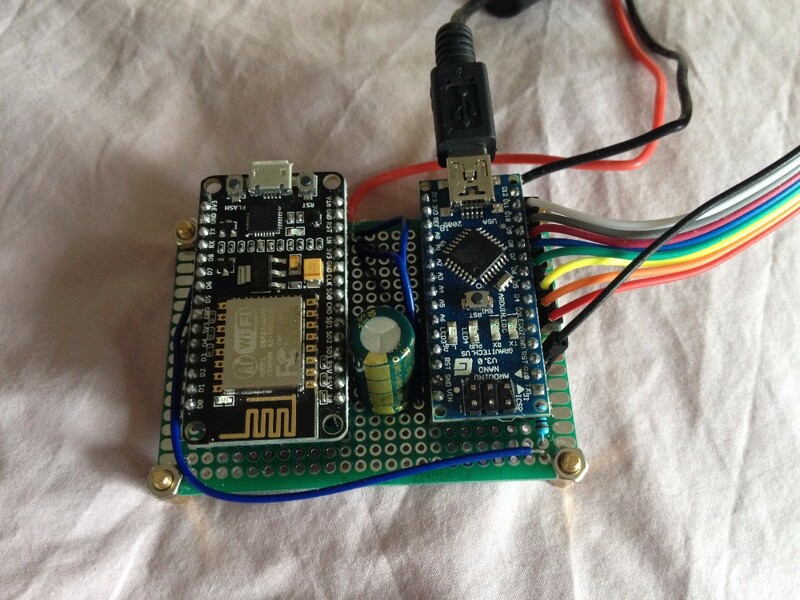 The NodeMCU is programmed with the Arduino IDE, and the only pin used is TX (serial transmission), connected to the Arduino’s RX. It can probably work with the NodeMCU only, if you can modify the library to use an ESP8266 timer. But i think it’s better to separate the wifi activity from the display activity, using 2 MCUs. Otherwise you may get a lot of noise in the display.